It is remarkable for a small community event to be popular for fifty-five consecutive years. That is how long Wye Parish has held its Annual Christmas Bazaar, known by many over the years as the best place to begin holiday preparations. 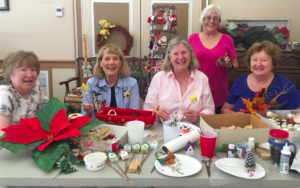 From 9 a.m. to 3 p.m. on Saturday, November 3, on the grounds and in the Parish Hall and Vestry Cottage of Old Wye Church, the Women of Wye Parish once again welcome the public to this harbinger of the holiday season. Old Wye is located at 14114 Old Wye Mills Road (Rt 662) in Wye Mills, MD. Handmade gifts are always appealing, and the women of the Church have been working throughout the summer and into the fall, creating knitted and crocheted infinity scarves, afghans, and other items. New this year in the Creative Crafts Shop are festive centerpieces for your Thanksgiving and Christmas tables. And there are always delightful original decorations for your tree. The Gently-Used Jewelry Table is a popular place to find unique, bargain-priced earrings, bracelets, pins and necklaces for someone special or for yourself. Nearby is the Unique Boutique, which features a variety of collectibles, and silver, crystal and china items – again at bargain prices. This year’s Silent Auction offers antique decoys, white wicker chairs, settees, and tables, as well as a host of gift items, from baskets of food, wine, and beer to handmade coats for some lucky dogs. Bazaar-goers need to watch the clock as bidding on Silent Auction items will close at 2 p.m.
Outside in the Vestry Cottage is a wide variety of books that are in good enough condition to give as presents. Featured are special editions, beloved children’s stories, and beautiful coffee table books as well as books about Christmas cooking and crafts. Outside, too, under the big tent is Attic Treasures with its great array of household items from utensils to lamps and tables. Food is an important part of a special event, and the Bazaar has food for gifts, food to take home, and food to enjoy as you take a break from shopping by visiting the Holiday Cafe. The Cafe will serve ham biscuits starting at opening time and, for lunch, Shore Chicken Salad, a hot entree, and a choice of soups. While parents shop or enjoy lunch, there will be supervised holiday crafts available for their children. The Sweet and Savory Shoppe has plentiful home-baked goods including pies, cookies and cakes. Shoppers always seem to head for the jellies, jams, pickles and other special treats made and preserved by the ladies of the Church. They make great gifts! Outside, all day, coffee (free starting at 8:30) is available. Also outside, and always an attention- getter, is fresh cider pressed during the Bazaar by the Boy Scouts on a locally hand-crafted cherry wood cider press. Wye Parish’s ECW (Episcopal Church Women) are the people responsible for making the Christmas Bazaar a popular and worthwhile event with a long history and loyal following. The proceeds from the Bazaar support the Parish’s outreach programs and selected capital projects of the Parish. For more information, call the Parish Office at 410.827.8484.